The Austin real estate market is so hot. For houses that are highly desirable, you really have to do some serious detective work. Today, I have a story about a home sale that was all facilitated through the Amber Ostrich Facebook page Before the home was even listed, it had an offer all because of AO! Do you remember the house we nicknamed “the Brady house” last fall? One of our shoppers, Katie Pixley, bought it, all because of those bright double doors she saw on Facebook. They were hoping to find the perfect home. A desire to move from new construction condo to a 50s-60s style, vintage home with a big yard and character led them to the home on Waterline. After Katie’s partner saw the photo of the house online, the couple began searching for vintage homes in Austin’s real estate market. They GUESSED at the potential location of the home based on age and style. Then found another home in that same area, that was listed as a home with “mid-century charm.” It turned out not to be the home they were looking for and eventually purchased, BUT it was in the same neighborhood. Her intuition proved right on, because after Katie drove by the listed home, she happened to find the Brady house just around the corner! Talk about destiny. It seems this home and its new owners were meant to be. After only 24 hours of searching. Fate, destiny, luck, whatever it was, it brought them together. 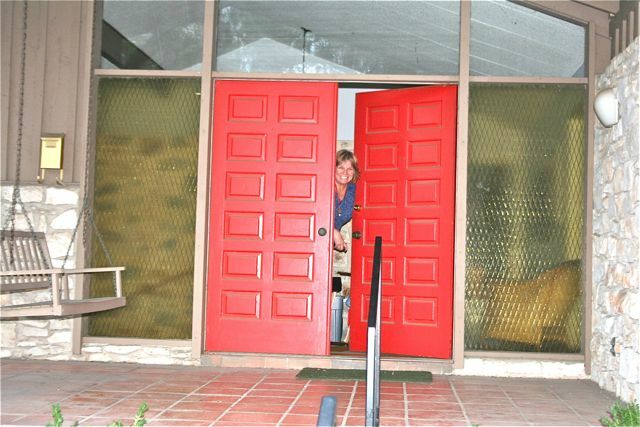 Katie said when she saw the red double doors along with the Amber Ostrich estate sale sign, she knew immediately it was the home they had been searching for. “I could not believe I somehow stumbled on this home without knowing the address or anything. I was so excited. I felt like I had just found a unicorn,” Katie said. Two days after stumbling upon their dream home, Katie and her partner lined up for the first day of the estate sale, hoping not so much for treasures, but wanting to get an eye on the inside of the house. “We’re a little bit of estate sale junkies, so we know the drill,” she said. After they looked through the house and peeked into the rooms marked “staff only,” Katie said they knew the house would be theirs. They put in an offer a few hours later. Currently, Katie and her partner are living in an apartment while the house is under construction. They’ll move in this fall. They are keeping the house as close to its original state as possible. 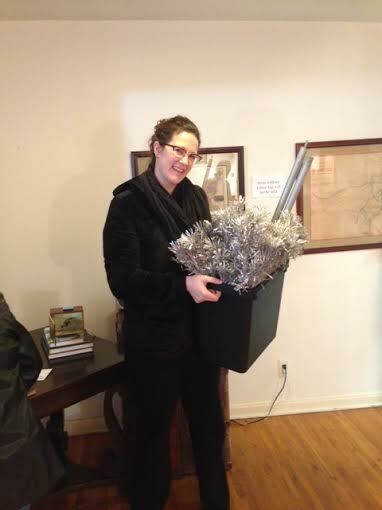 She also bought this oh-so-sweet vintage aluminum Christmas tree at the Fred Webster estate. 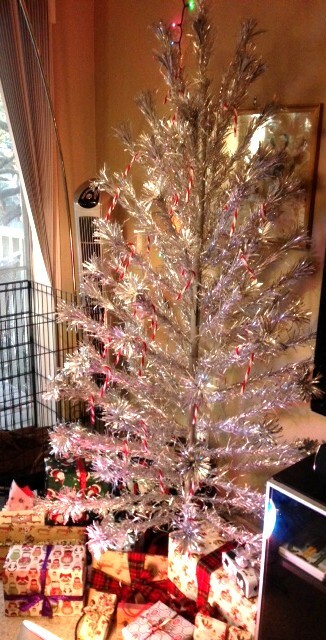 Katie sent me this photo of the aluminum tree she used last Christmas. This fall, she’ll be moving into the home after it’s been remodeled and the tree will have its permanent home. It’s so cool when things come full circle.